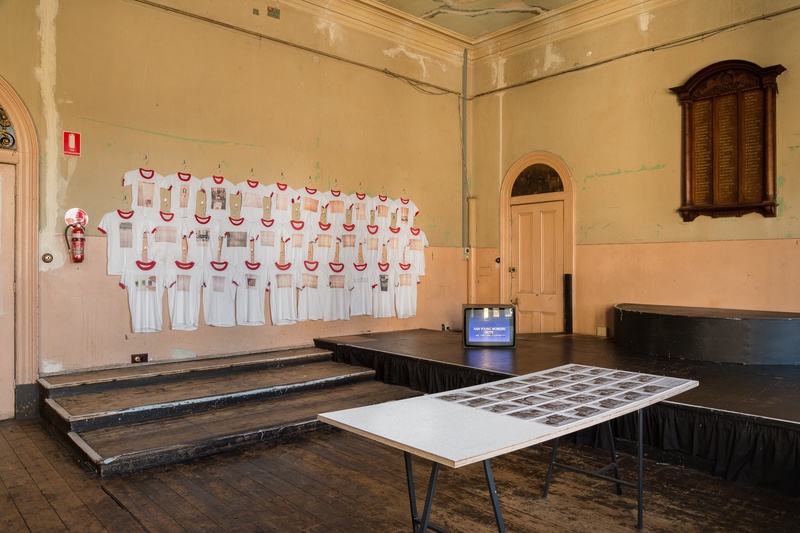 At various times over the coming years, a program of exhibitions and events will be presented across sites within and around the Victorian Trades Hall. This is the world's oldest trade union building, and has served as a home for trade unions and the discussion of labour issues since Melbourne stonemasons won the world’s first 8 hour day in 1856. Its association with the arts began almost immediately, when it became the home of the Artisans' School of Design, one of Melbourne’s first art schools.1 Since then it has housed countless workers art associations, guilds, artists' studios, and artist unions. This program proceeds from thinking under this roof, with a duty to experiment in thinking about the labour of artists and the many ways in which artists, through their work, address social issues with absolute diversity. This aim has been reserved, not as a prescribed task, but as an open question from the beginning. Such errands in thinking should maintain enough room for the upsets and detours that we hope for the word “experiment” to always afford. Here we have the time and place to think about art, its origin, and the welfare of the people that make and maintain it. 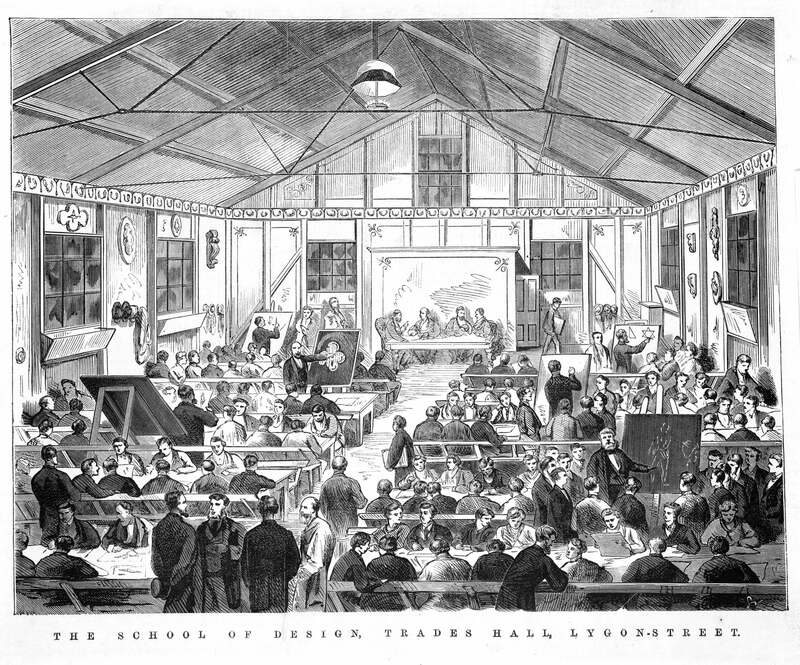 "The School of Design, Trades Hall, Lygon Street" [ed: Artisans' School of Design], Samuel Calvert, The illustrated Australian news for home readers, 10 Oct 1870, p173; Pictures Collection, State Library of Victoria"
Art & Working Life was a joint funding initiative between the Australia Council for the Arts and the Australian Council of Trade Unions. During its tenure it funded and promoted the creation of cultural activities by artists, art workers, and unions in and out of the workplace. As Ian Burn and Kathy Muir wrote in 1992, the program aimed to ‘encourage art practice and policy, informed by the concerns and issues affecting workers own lives and acknowledges working class cultural traditions and the multicultural nature of those traditions.’ In operation until the early 1990s, it has an ambivalent legacy: some criticised it for catering too much to the desire of artists and the ‘values of the artworld’, while others saw it as an instrumentalisation of art for political aims. This panel discussion focuses on the historical legacy and contemporary relevance of the Art & Working Life program. The import of the program, for both the institutions of artworld and the labour movement of today, will be discussed with some of its key stakeholders. An audio recording of the event will be available in the future. 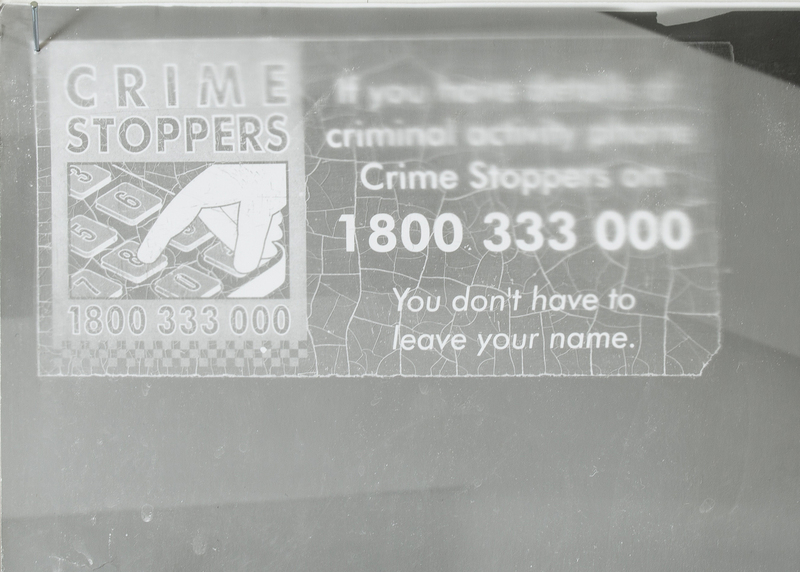 The State of the Union panel series is supported by the City of Melbourne Arts Grants Program. This document is published on the occasion of 1856 reproducing the Art & Working Life slide-kit for exhibition as a part of State of the Union, Potter Museum of Art on view until 28 October 2018. The following slides from the Art & Working Life slide-kit are reproduced here from a copy sited in the archive of Ian Burn. The accompanying script has been transcribed from Art: Critical, Political, a book edited by Sandy Kirby in 1996 focusing on Ian Burn’s work in the Australian labour movement, as a key activist and historian of the 1980s. Only small edits and corrections were made and do not affect the integrity of the original, leaving the idiosyncrasies of Burn’s writing style intact. The kit itself was produced by Burn for Union Media Services, a design and communications company working for trade unions primarily ran by himself and fellow art workers Julie Clark, Ian Milliss, Lesley Pearson, and several others . The slide-kit’s purpose was to provide a short overview of the history of working class culture in Australia and give contemporary examples of the ways in which the Art & Working Life program was fostering cultural work in the labour movement. 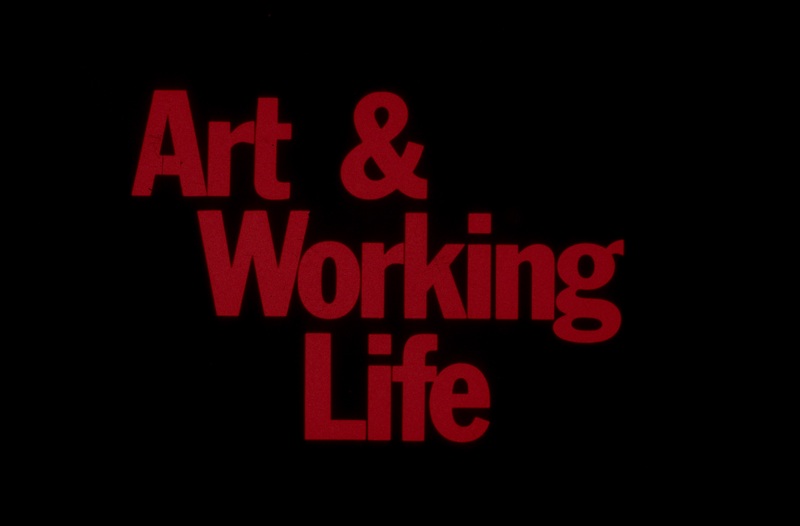 In 1984 Burn produced, through Union Media Services, an ‘Art & Working Life’ slide kit for the Australia Council, which he updated and revised two years later. Two texts were provided. One, to be read aloud, the other supplying more detailed back-up information on the projects, the artists involved and the policies supporting Art and Working Life projects. The optimist of the mid ‘80s is captured in the spoken text reproduced here with slides from the 1986 kit. A reconstruction (1) of Walt Disney: An Ideological Critique by Media Action Group (Ian Burn, Nigel Lendon, Terry Smith, Michael Dolk, Kieren Finnane, Mary Kinney, Ian Milliss, and Anne Sutherland); and its precursor We Are Not Happy Robots by On Our Own Time (Bruce Kaiper). It is now a long time since these works have been presented publicly, and it is likely that they were never screened in Europe. We Are Not Happy Robots was made by Bruce Kaiper in 1976 and screened to various audiences of workers and activists in the Bay Area of California. 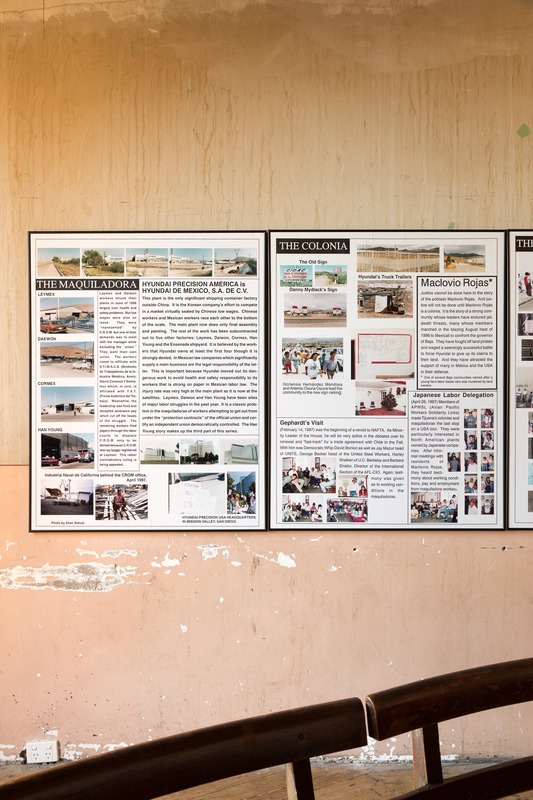 In the previous year, Kaiper published his photo-essay "The Human Object, and its capitalist image” in Left Curve (2), where he was then co-editor. Both essay and slideshow share the same object of critique: modern manufacturing—its separation of manual and intellectual work, its privileging of the role of communication in production, and its gross augmentation of the managerial class. This is the story of the divorce between the head and the hand of the worker, as told by Marx, and again by Alfred Sohn-Rethel and Harry Braverman (of whom Kaiper owes much of his critique). 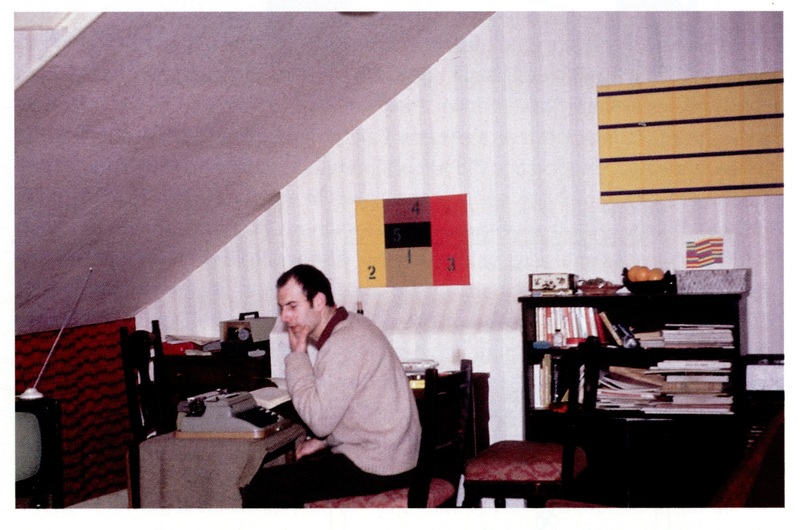 A well dug out suspicion holds that Burn’s notion of the deskilling of art practice that occurred in the 1960’s and 70’s, first introduced to an art historical context in his essay Crisis & Aftermath (1981) (3) , owes a debt to Braverman (via Kaiper). In “The Human Object”, Kaiper is first to apply a Marxist critique of the division of labour to a critique of the production of conceptual art. He concludes that the production of art in this manner (the privileging of intellectual labour over its manual counterpart, and the outsourcing of production) was reflective of modes of production in other economic spheres. 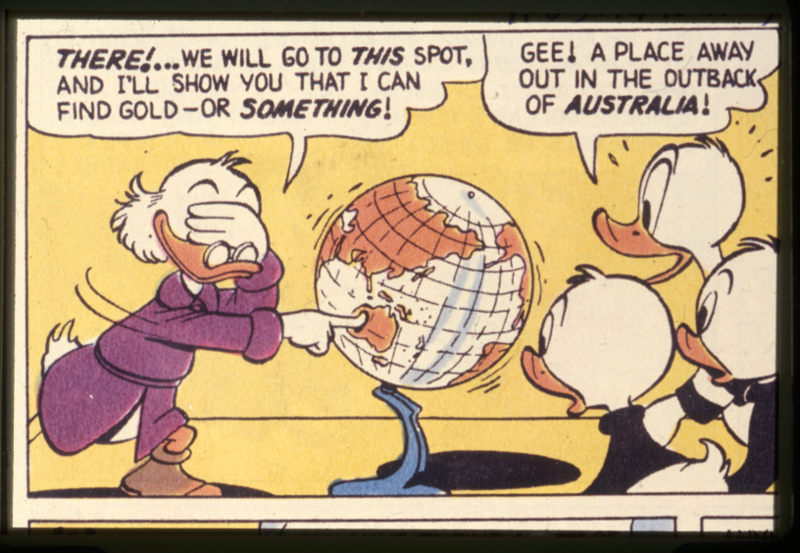 Media Action Group refocused Dorfman and Mattelart's critique, and looked to Disney’s picturing of Australia (and the continent’s natural resources) as the site for the expropriation of wealth to the gains of power—Scrooge McDuck as mining magnate, in search of uranium during the Cold War… This slide-essay was made in a political atmosphere that included activism against the nuclear arms race and the residual socio-political effects that followed the end of the American occupation of Vietnam. It is due to these social facts that this document is indicative of a larger feeling among Australian artists of the time, and marks part of a transitional period for Burn (from artist, to critic and unionist).The sense of social responsibility held by the artists of Media Action Group is at the foreground of this work, where critique is measured out by plain language teaching. Indeed, its educational logic is inherent to its form. It was prepared for distribution as a teaching aid and integrated into art school curricula by Burn and his colleagues. Here he joins his peers Alan Sekula, Fred Lonidier, Martha Rosler and Phel Steinmetz at the University of California San Diego where he is invited as a guest professor. These artists shared certain political orientations, held aims for art to maintain a certain critical edge against society, and all took part in degrees of political activism. 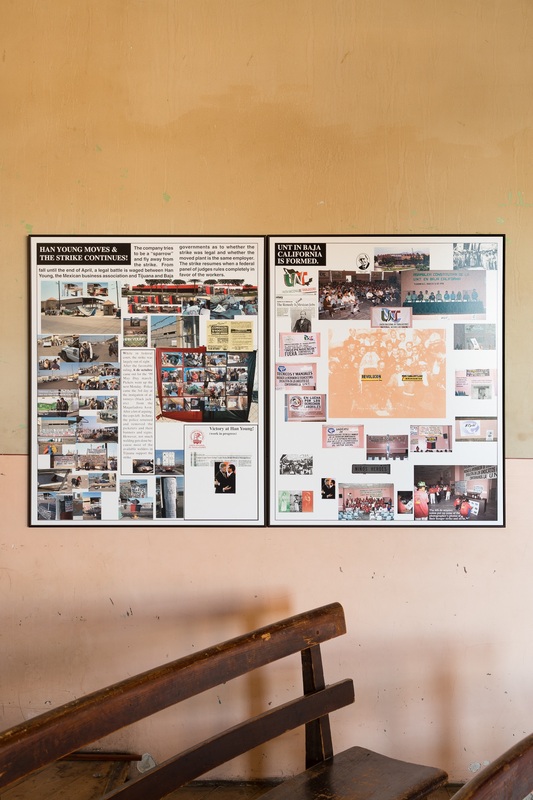 Notably, both Lonidier and Sekula were developing critical uses of photography as a means for social change, with considerable focus on working people and trade unions. 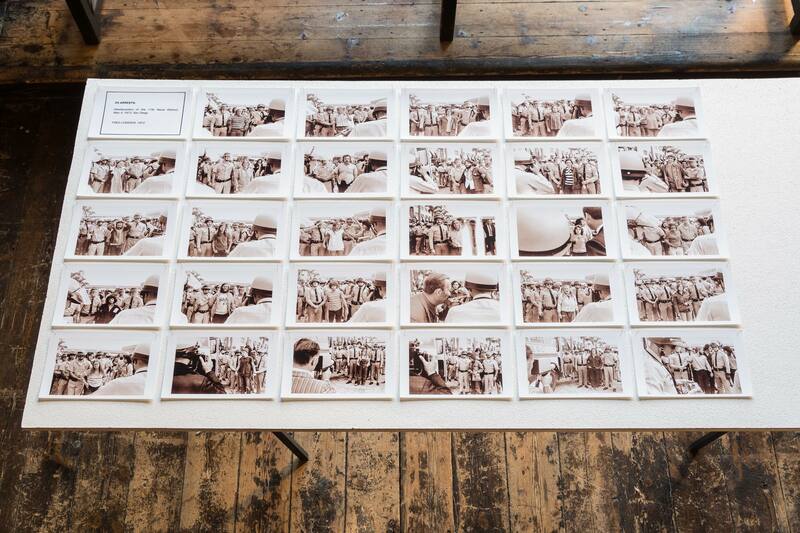 Two years later, in the winter of 1978, Alan Sekula’s Dismantling Modernism, Reinventing Documentary (7) is published. 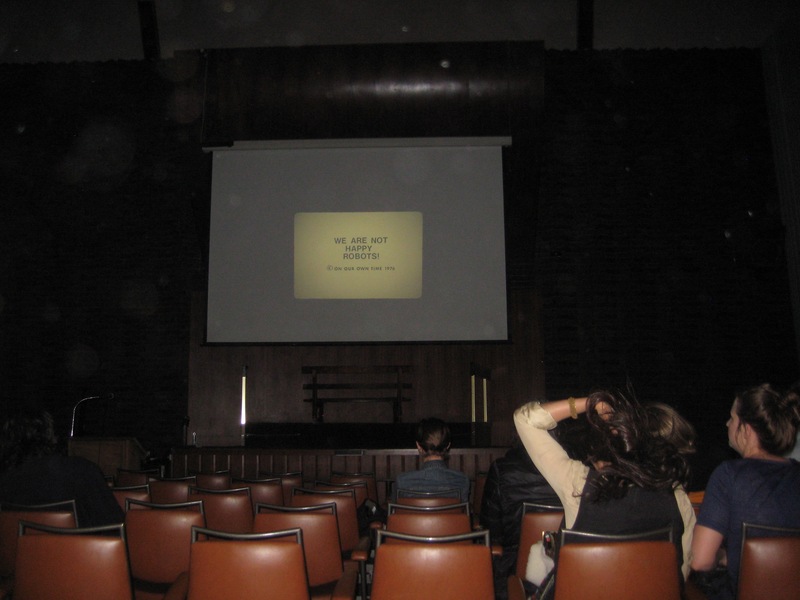 In this essay Sekula discusses the work of his aforementioned peers in-depth, and notes the cultural work of Bruce Kaiper who was making critical use of the slideshow format in Oakland. With Kaiper’s We Are Not Happy Robots (1976) in mind, Sekula wrote that “A number of cultural workers in the Oakland area are using slide shows didactically and as catalysts for political participation [...] These shows are designed primarily for audiences of working people by people who are themselves workers." 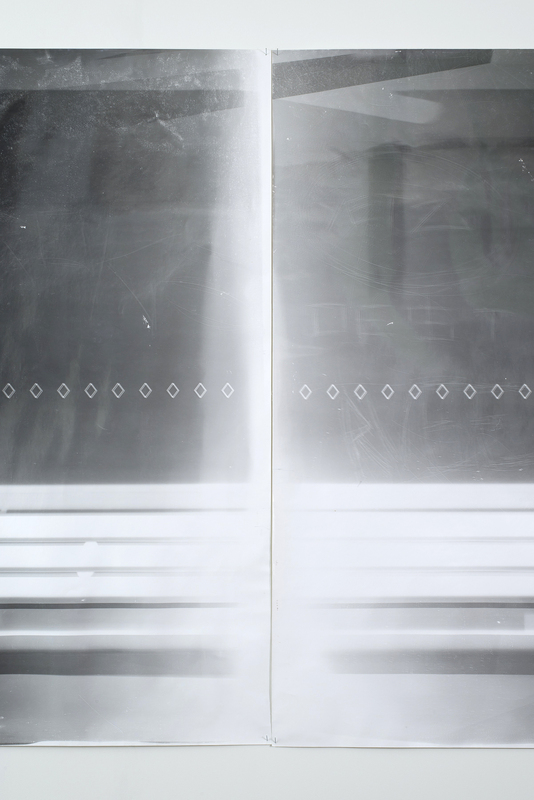 Through Left Curve, a journal then co-edited by Kaiper, Burn establishes correspondence. From Kaiper, Burn receives copies of We Are Not Happy Robots and takes these with him back to Australia. On his return, Burn joins Nigel Lendon and Terry Smith of Art & Language, as well as Michiel Dolk, Kieren Finnane, Mary Kinney, Ian Milliss, and Anne Sutherland to form the core of Media Action Group. (8) Possibly led by Kaiper’s example, the group produces a number of slide-essays on socio-political topics, made especially for presentation to Australian trade unions, community activist groups, and students. Media Action Group would later became Union Media Services (UMS), a company that produced slideshows, journalism, design, and media for Australian trade unions. Amongst many projects, the work of UMS supported Art & Working Life, a program jointly administered by the Australia Council for the Arts and the Australian Council of Trade Unions, that focused on the cultural life of workers and the collaboration between artists and trade unions. The first of its kind. Thanks to Avril Burn, Ann Stephen, David Homewood, Bruce & Ellen Kaiper, Nigel Lendon, Lucina Lane, Paris Lettau, Fred Lonidier, Deborah Mills, Terry Smith, Benjamin Thorel, Section 7 books, and Air de Paris. (1) This has been reconstructed from the remaining slides from the estate of Ian Burn, with the assistance of Nigel Lendon. This term has consequently been used by Benjamin Buchloh and John Roberts in differing applications. For their usage, see: John Roberts, “Art After Deskilling”, Historical Materialism, No. 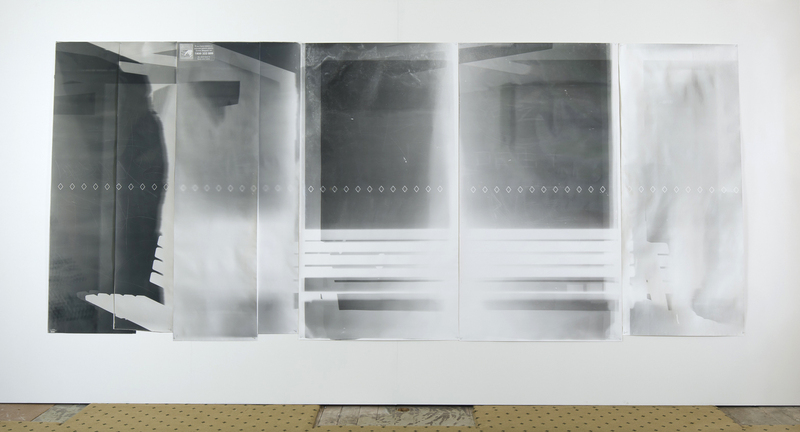 18, 2010; Benjamin Buchloh, Gerhard Richter: Painting After the Subject of History, Ph.D. Dissertation, City University of New York, 1994. (5) Karl Beveridge & Ian Burn, “Don Judd” in THE FOX #2, 1975; Ian Burn, Nigel Lendon, Terry Smith, “Why Do They Keep on Coming” in The Great Divide, 1977; Ann Stephen, On Looking at Looking: The art & politics of Ian Burn, The Miegunyah Press, 2006, p.170-171. This season at Melbourne Cinematheque focuses on the work of Harun Farocki. This is a simple introduction, brief, and with the expected gaps that any retrospective view affords. For an artist whom the cinema was only one output, we settle in our seats knowing that what is on screen is a limited view at the scope of Harun Farocki’s work with moving images. This activity was not cynically motivated, nor was it to miser production budgets, direct vanity projects, or settle into comfortably paid bureaucracy. Farocki was an artist who—inspired by his daughters’ adoration of children's television—directed segments of the German adaptation of Sesame Street with his collaborator Hartmut Bitomsky[^2]. Such jobs provided the means for Farocki—providing not only money, but technology and an audience—that he always managed to make his own. These are Farocki’s lessons. Whatever the medium, scene, or circumstance, he dealt eloquently with its language and gave it back to us on display. His commentary ranged from direct to tacit, but regardless of the immediate volume, his films contain the important lessons of a term that is often overused and certainly overripe: “critique”. 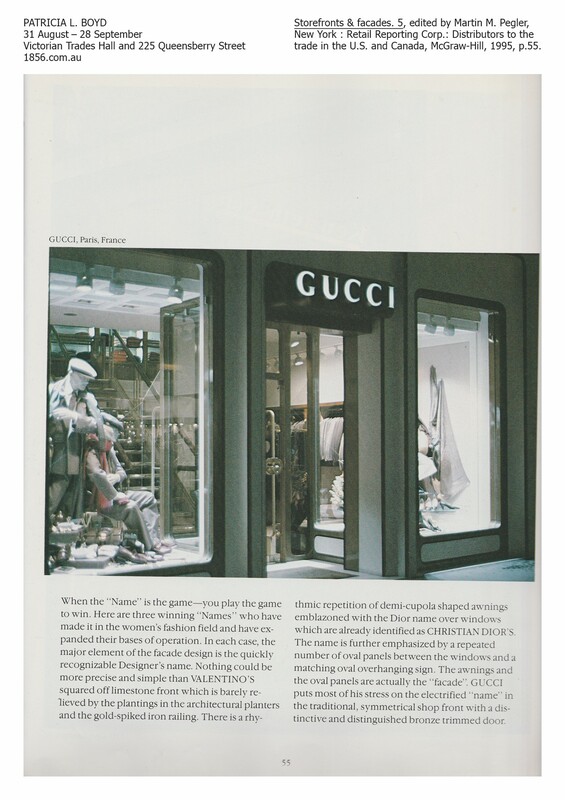 Farocki shows us that the true character of criticism is not in an arrogant posture, but in the produce of skill. He certainly had an aptitude for craft, and it is from his formal proficiency that he gifted to us the images that we exhaust ourselves trying to explain. Such attention to form is often taken for granted in the excesses of interpretation, but skill—even if we struggle to uncover or define its limits—was an indispensable motor for Farocki’s vocation as an artist, and indeed in the foundations of human labour itself. 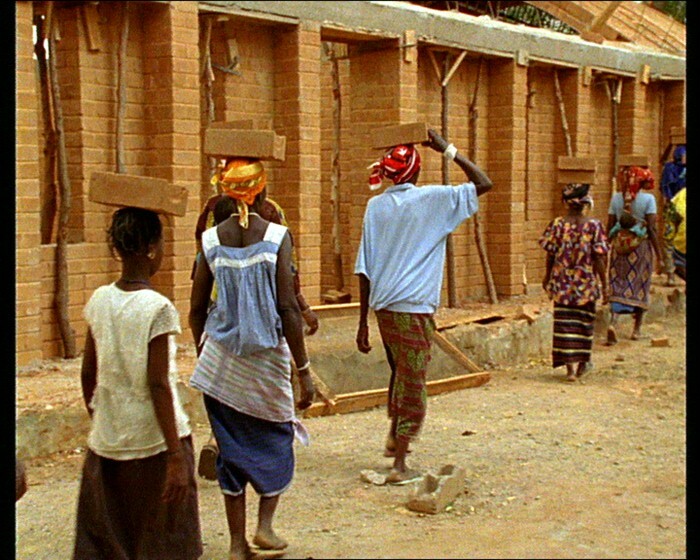 It then comes as no surprise that scenes of work, labour, and the production process occupy much of Farocki’s films. He shows us the banality of work; the gradient from its hyper-visibility to its disappearance; its pressures and conflicts and upsets; its histories and representations; its rhetoric, skills, and artistry; the humour in it; its agents, places, and objects; its changing and primal scene; its affect and consequences; its place amongst the many ways of living; and at bottom, its import. It is not the total character of his work, but it is its ground. It is from this view that Farocki’s films can be an aid in meditating on what it means when we use the word “work”. It is suggested, with care, that observations such as these should be reserved as a simple consideration, or as a small entryway into his body of work. The broader lessons of Harun Farocki are in the films themselves; they educate in a way that escapes the simple diction used in summaries such as this, and they are why we must take our job as audience seriously and watch for what they impart. Harun Farocki (1944-2014) was a German filmmaker, critic, educator, and artist. 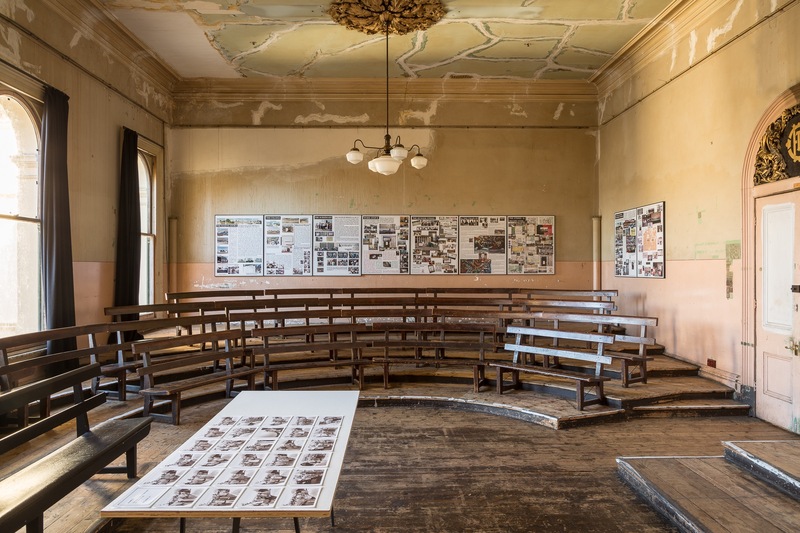 Born in German occupied Czechoslovakia, Farocki was educated in Berlin before he and Harmut Bitomsky were thrown out of the German Film and Television Academy for political organising. His rich and diverse career never strayed far from his political conscience, citing Bertold Brecht and Jean-Luc Godard as primary influences. Receiving high acclaim in both filmmaking and contemporary art circles, Farocki exhibited extensively internationally. Thanks to the Melbourne Cinematheque, Antje Ehmann, Matthias Rajman, Lucas Quigley, Giles Fielke, and the Harun Farocki Institut. Fred Lonidier is an artist and union activist who has been making art “with, by, and for” trade union members since 1976. The labour movement and class struggle has been the subject and motivation for much of Lonidier’s work since he graduated in 1972 from the University of California, San Diego (UCSD). From then, until he recently retired, he served as a member of the UCSD faculty, teaching photography in the Visual Arts Department and counting among the membership of the American Federation of Teachers. If we are to look at Lonidier’s archive of exhibitions, we can be quick to detect that trade union halls supplant the art gallery as Lonidier’s primary site of exhibition. What this suggests is that Lonidier is as sensitive to the reception of his work—to whom, where, and why a work of art is presented— as he is to the political content of the work itself. With this care for presentation, Lonidier’s work raises questions about how political commitment is situated in the arts while retaining all the queries pertaining to medium, form, and content that fine art has traditionally held so closely. 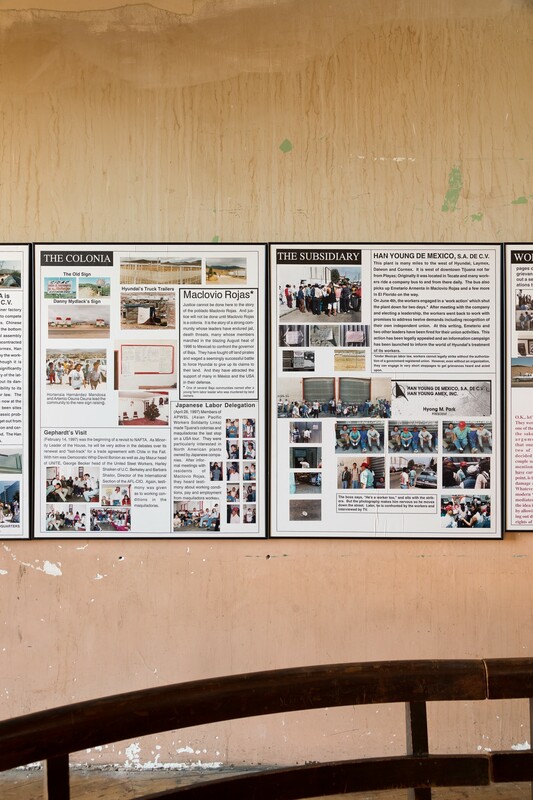 Its aims are underwritten by a take on documentary photography thought through conceptual art and the cultural heritage of the labour movement. This exhibition presents three sets of work by Fred Lonidier selected from the past 45 years, in the Old Council Chambers of the Victorian Trades Hall. 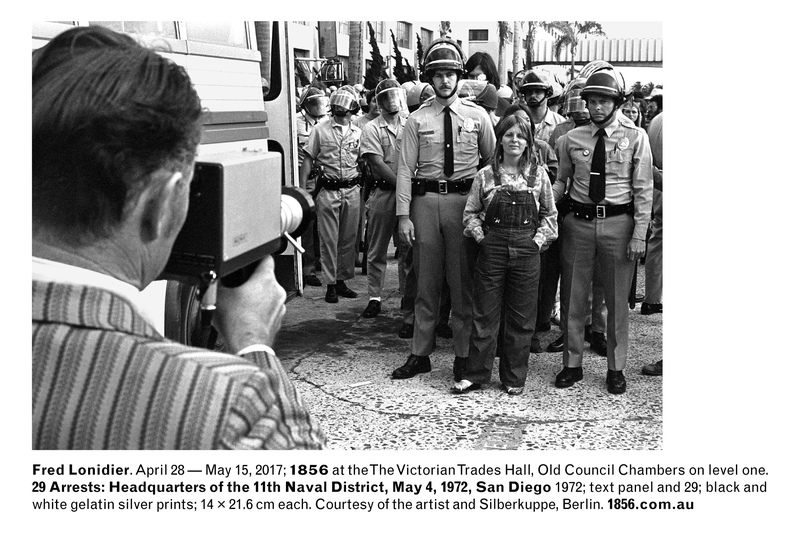 The earliest work, 29 Arrests (1972) dates from Lonidier’s time as a student at the University of California San Diego, where local anti-war demonstrators protested against the US invasion of Vietnam; produced four years later, GAF Snapshirts (1976) marks a transition in Lonidier’s work from an analysis of photographic discourse, to a consideration of the labour practices in artistic production; and the most recent, a 1997 selection from a decades long project entitled N.A.F.T.A (Not A Fair Trade for All), is an example of some of Lonidier’s work developed with, by, and for organised labour on the Mexican-US border. Gallery 1199 of the NYC Hospital Workers Union, to name only a few. 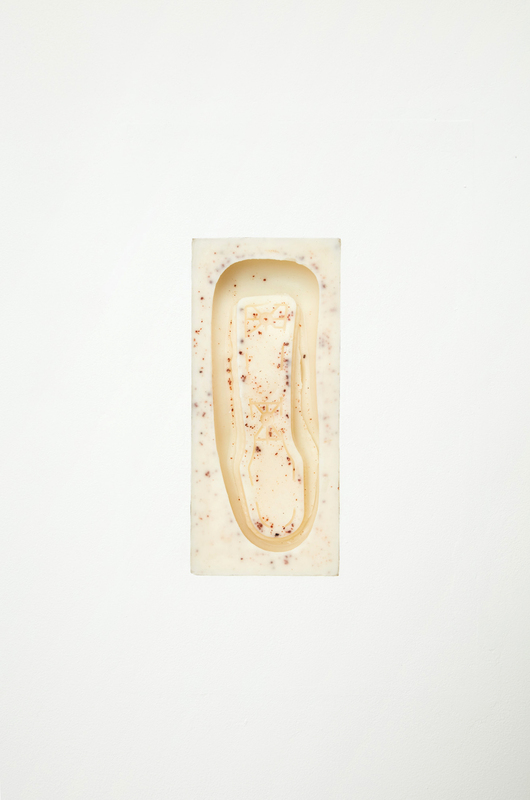 Fred Lonidier is represented by Silberkuppe, Berlin; Michael Benevento, Los Angeles; and Essex Street, New York. An exhibition of new work made by Patricia L. Boyd in Melbourne, presented across two locations: at Victorian Trades Hall and a coworking creative office space 225 Queensberry St, Carlton. Please note that Meeting Room 2 is an active organising space and in some instances, may not be accessible on Friday afternoons. materiality asks to be accounted for just as much as their images. Adshel bus shelters there are still numbered “0001”. Total Estimated Cost: $193,000,000 over 16 years. are available on the National Rent Affordability Scheme. This ongoing series of casts reproduce in negative the form of an extant, mass-produced part of an armrest of an office chair. The “Aeron” chair (also used in the offices in which this work is shown) was manufactured by Herman Miller, the influential furniture manufacturer also credited with the invention of the office cubicle, and is notably associated with the “dot-com bubble” that occurred in the US from 1995-2000. Marketed for its ergonomic properties, it was fetished by a then growing self-tasked cognitive workforce, anxious of the occupational health risks associated with prolonged time at their machines. Emblematic of the desires of these workers, it attests to a disciplining of the body in a bid to prolong time spent at work with computers in efforts to increase productivity. Boyd acquired this chair from a liquidation auction of a company undergoing intensive restructuring. These liquidation auctions allow companies to re-monetise their assets (furniture, equipment, intellectual property), usually as a means to pay debts before closure. In this case, the chair was purposefully pulled from its circulation in this particular market to be put to another use. Similarly, the material of the casts is also pulled from circulation. These casts are composed of grease purchased from a refinery company that source their raw material from the oil vats of restaurants across the greater San Francisco area. This material, at a point of stasis—before it is cleaned, refined, and re-commoditised as fuel for cars—is both the result of waste processes, and source of potential energy. As art it remains locked off from its use-value by the static time of conservation, while entering the symbolic and monetary economies of the art system. 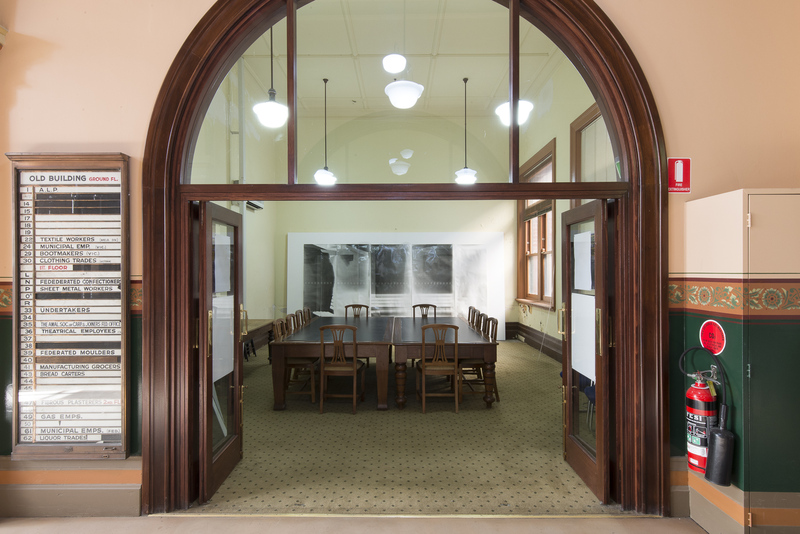 The placement of Patricia L. Boyd’s work within the Victorian Trades Hall suggests that the social responsibility of art is not necessarily at war with the formal intelligence through which artworks operate. Her work is perceptive to context, process, and the broader dynamics that influence, affirm, undermine, and even absolve the claims made by art with regards to its social position, especially at this site where our social roles are foregrounded. The everyday function of this building, a civic space, overrides the claim that art only addresses a detached spectatorship. This context places certain demands on the artist, on both her labour and the product of her work; for the viewer, it elicits the long practiced historical debates on art’s purposiveness in society, its political import, and utilitarian value. These demands are in part symptomatic of the associations, real and imagined, that are made in such a building. And perhaps, whatever is left of the artworld's wishes for art to have an effect beyond its own discourses, is magnified by this setting. 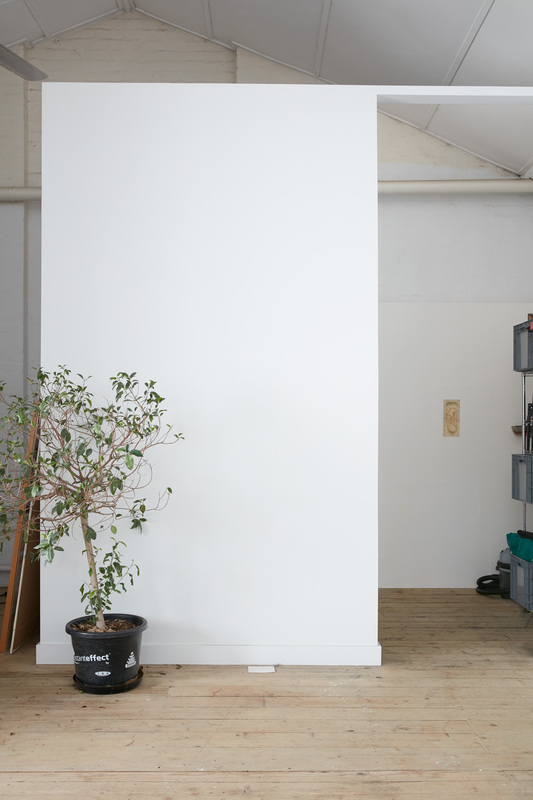 The second site is another place of work, a small former-warehouse privately rented by a team of “creatives”. Their studio upstairs is offset by a coffeeshop at street level, where a convivial setting invites use of the space from others working in "gig" economies without a fixed place of work. But principally, web and print are designed here for a host of clientele on a contractual basis. It is a place where matters of form are mandated, and subsequently produced in service of communicating to a broad range of the public. It is a site of non-unionised, independent labour and entrepreneurial enterprise—if it is a civic space at all, it is only in the limited extent to which a coffeeshop becomes a place of social exchange over the purchase of a cup of coffee. But if there is a dichotomy between these two sites, it is not by equating the Trades Hall as a symbol of manual labour, and this studio as emblematic of another kind of work—one that is technologised, precarious, cognitive, and “creative”. 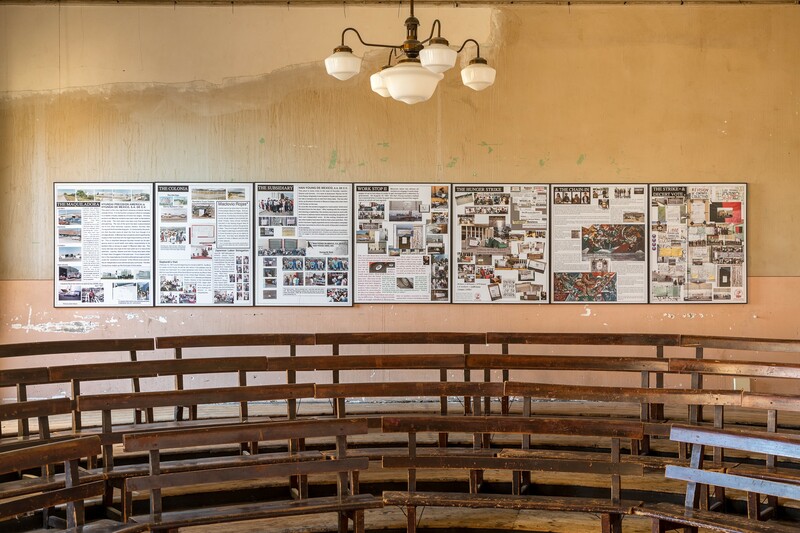 While maintaining an emblematic relationship with manual labour, trade union halls are primarily sites of organising—a labour of communication, management, politicking, analysis, and legal work. The truth is, as a part of this, the trade union sees much of the same kinds of labour as a design studio or advertising agency. Now with trade unions increasingly driving campaigns through targeted advertising (for example with the recent media campaigns #WageTheft, and “Change the Rules”), and representing a workforce gradually more casualised and less secure in their employment (i.e., gig economies, and precarious labour), the operative position of labour activism is ever more reflective of the skills of the “creative class”. In both contexts, Boyd has installed works of art that speak to broader circulations (of energy, bodies, resources) and the places in which they intersect. These economies and their corresponding sites are inferred by residue, impressions, surplus effects and waste. Although appearing abstract in their language, these pieces are specific documents that work by index. 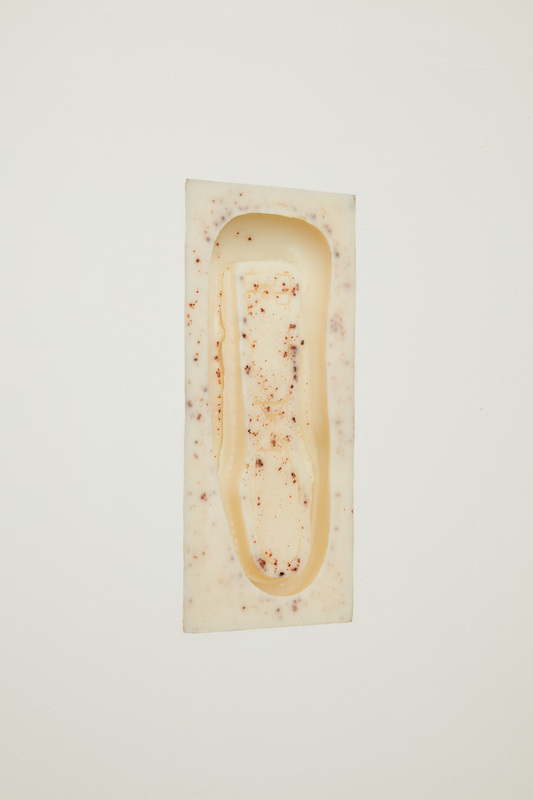 What is central to their position is a collective human experience, mediated first by the body of the viewer. It is from the body, with its own circulations and systems (be it social or digestive), that Boyd's work begins. Patricia L. Boyd (b. London, UK) lives and works in New York. Solo exhibitions include Operator, 80WSE, New York (2017); Le Bourgeois, 3236RLS, London (2017); 1:1, Jan Kaps, Cologne (2015); and Metrics, Modern Art Oxford (2014). 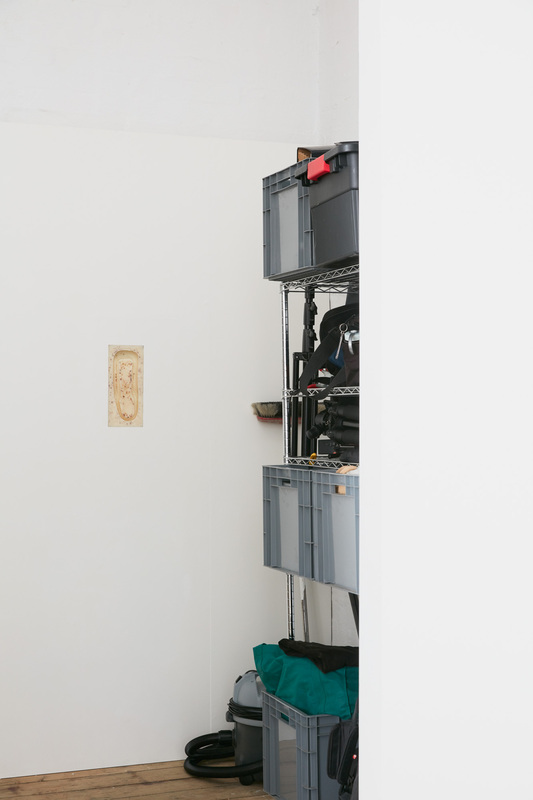 Group exhibitions include Mechanisms, CCA Wattis, San Francisco (2017); Interiors, Front Desk Apparatus, New York (2017); Representative Politics, Steirischer Herbst, Graz (2015); and Meanwhile... 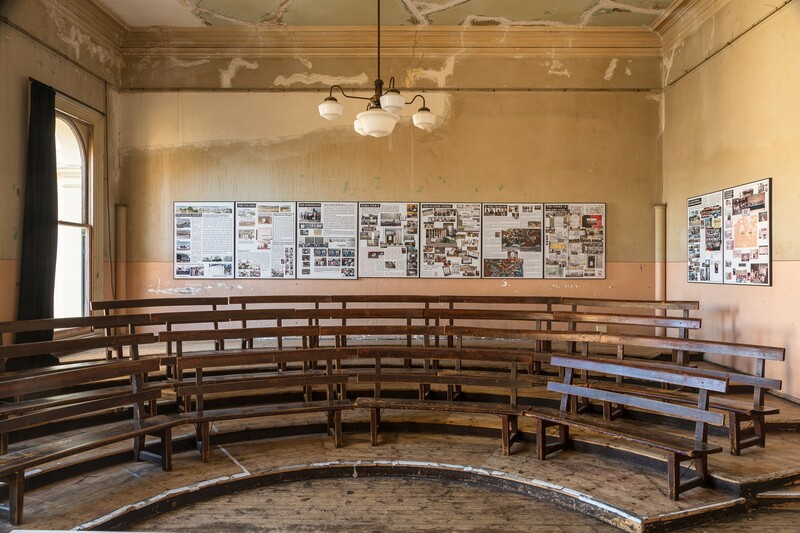 Suddenly and Then, 12th Biennale de Lyon (2013). 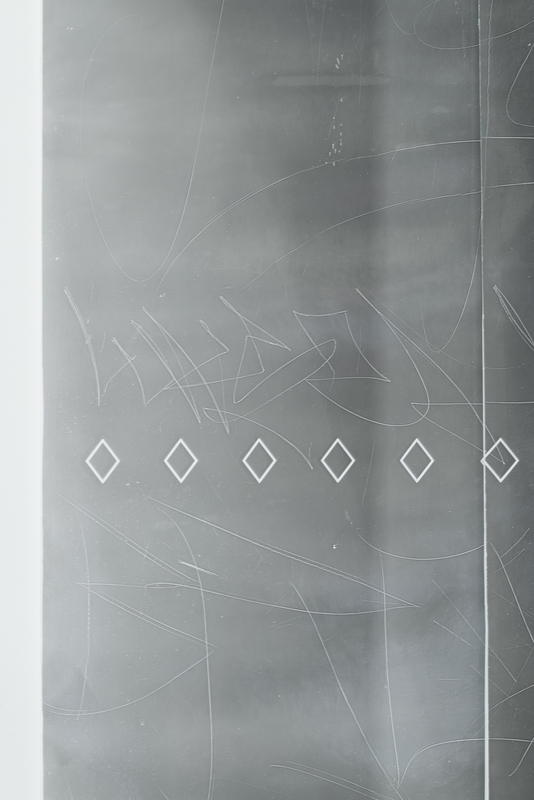 In 2017, she organised AEROSOL, at 500 Capp Street Foundation, San Francisco. Production Assistance by Liam Osbourne, Lucina Lane, Nicholas Mangan and Giles Fielke. Patricia L. Boyd thanks David Eagan, Kate Meakin, Nina Gilbert, Lucina Lane, Rudi Williams, Giles Fielke, Nick Mangan, Joshua Petherick, Sari de Mallory, Nicholas Tammens, and Ziga Testen. Nicholas Tammens thanks Liam Osbourne, Bez Worcou, Sarah Aroha Rameka Scott, Paris Lettau, Neika Lehman, Robert Snowden and the Victorian Trades Hall. Tom Zubrycki's unfinished documentary film on the history of the Australian labour movement, from the 1850's up until the bicentenary of 1988. Originally sponsored by the Australian Council for Trade Unions, produced by Film Australia, and funded by the Australian Bicentennial Authority, the film was effectively censored when the ACTU rejected the film's representation of union history. 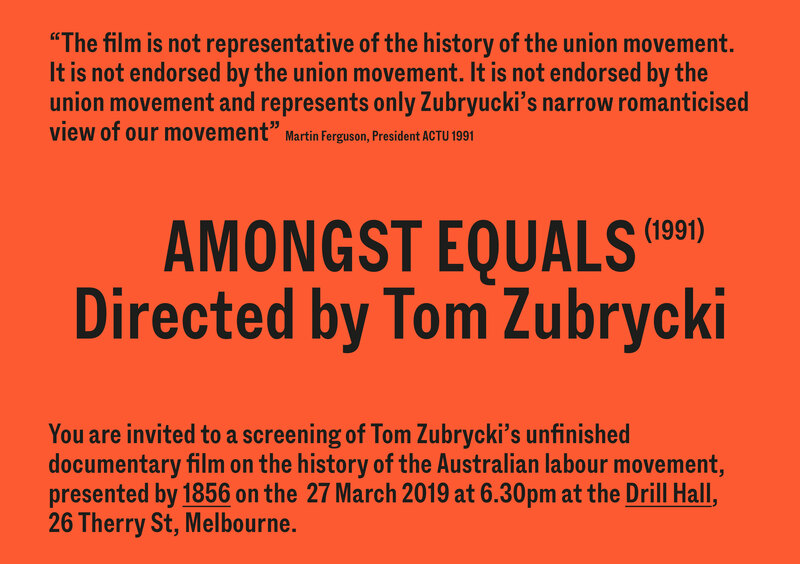 On the occasion of these screenings, 1856 publishes a pamphlet with an excerpt from John Hughes' manuscript for his essay “Zubrycki’s Point: Amongst Equals, utilitarian film in the Australian labour movement”, on the controversy surrounding the production of Amongst Equals. Among the many cultural projects sponsored for the Australian Bicentenary, the production of Amongst Equals was directly implicated in the writing of officiated history. Surrounding the making of this film were a series of events that led the ACTU to withdraw its support for the film and rescind its relationship with Zubrycki. At the bottom of this was Amongst Equals’ acknowledgement of the historical defeats of the labour movement, and the film's emphasis on struggle rather than consensus in advancing workers’ interests, which effectively highlighted an ideological division in the union movement that was perhaps at its height in the 1980s. Ultimately, the ACTU’s final position on the film did not reflect the wishes of many unions and trades hall councils across Australia, mirroring the shift in power contemporaneous with the making of the film, from the activism of union members on a local level, to the officialdom of the ACTU and the Australian Labor Party. What was at stake for the labour movement with Amongst Equals was the politics of its own history, a politics that is as broad as the political positions operative in the Australian union movement up until this day. The representation of this history came to be the cause of dispute over the film and its eventual censorship by the ACTU. Today the history of Amongst Equals gives cause to questions latent in all projects seeking to represent history: namely, who writes history and signs off how it is represented; how adequate is any representation of social experience; and in the case of a film such as this—or any work of art with a utilitarian or instrumentalised purpose—who determines the meaning of a work and its story? The organisers wish to acknowledge that this program is largely produced on the traditional lands of the Wurundjeri people of the Kulin nation. We pay our respects to their elders, both past and present. Edwina Byrne, Anthony Davies, Helen Johnson, Deborah Mills, Lisa Radford, Robert Snowden, Lise Soskolne, the Victorian Trades Hall Council, Sam Wallman, Yale Union, and many friends. Website built by Public Office. Self funded, with little money. With in-kind support from the Victorian Trades Hall Council.